It feels like a year since I last posted, but it has only been five days. We were supposed to fly to a family gathering this weekend. That was the plan, anyway. Winter air travel is always dicey. 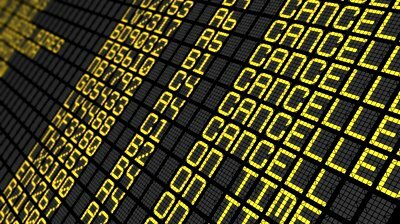 We’ve been pretty lucky over the years to avoid bad delays, or when they happened we were able to reschedule for a set time to avoid the autism parents’ nightmare scenario: hours and hours of airport uncertainty. Well, our luck ran out this time. At first weather at our destination threatened the trip, then weather at our departure. At various times, we were booked on four different flights, to two different destinations, on two different days. In a cruel twist, at the end, the only thing that went anywhere was our luggage. There were tears, and anger, and frustration aplenty. There were hours of waiting. But there was more, too, so much more. And that’s the part I want to tell you about. My kids were absolute champs. We waited around the airport for almost five hours on Thursday. During that time, it was never certain that we were going anywhere — which made it that much harder on Ryan’s anxiety. Yet, he remained calm and even cheerful for much of it. It was only when, a few minutes from boarding after a three-hour-plus wait, we were told that our crew had timed out that he began to lose control. I saw his pained expression, his frenetic activity, and his outward expressions of anger, and I knew we couldn’t put him through much more. Veronica knew it, too. We understand our child better than we used to. It was time to advocate for him. I approached the gate agent, who was worn out from dealing with unhappy passengers for hours. I was calm and polite, but told her there was about to be an ugly incident if I couldn’t give Ryan some concrete information. I told her why. She pointed me to a customer-service line with about 200 people in it. In the waiting area, Ryan was close to full meltdown. His central nervous system was on tilt. The area was crowded. People were noticing. Veronica invited one staring passenger to direct her attention elsewhere. Ryan deserved that level of advocacy from us, and I love that Veronica delivered it. The clock had struck 12. It was time to go home. I found some customer service phones near that enormous line (Pro tip: always try the phones) that connected me directly with an airline representative. I explained the situation and was told we qualified for a full refund. As badly was we wanted to visit family, we knew it was the right decision. The agent offered to try a different airline. He offered to put us on a Friday flight. But weather was again going to be an issue on Friday. We took the refund. While I was on the phone, Veronica did her best to calm Ryan and Riley, who was now sobbing with disappointment. The flight we were waiting for was officially cancelled. All we needed was to collect our bags and go home. The phone agent was as helpful as he could be. When I told him there was no way I could wait in the customer service line, he told us to head right to baggage claim, where the line was much shorter. We filled out a claim, and went home, tired, upset, emotionally drained, and empty-handed. Friday would end up being a mental health day for all of us. We got our luggage back Friday afternoon after learning that it had gone to our destination on the one flight that did get out. We made the best of the weekend at home, getting our Christmas tree a week early and decorating the house. 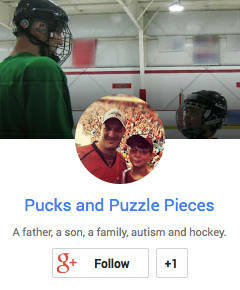 Ryan was able to make his first street-hockey game of the new season, and even scored a goal. We watched a ton of hockey and football together. I’m bitterly disappointed, but I’m proud of my son — something we told him over and over. I’m also proud of how we advocated for him. That hasn’t always come naturally. Years ago, our instincts were more to try to get him to act just like everyone else. We know better now. Experience is a wonderful teacher. OMGosh. FIVE hours. That’s an amazing feat for Ryan! The situation you described is one my worst nightmares and I narrowly avoided it when I used to travel with Roc from the East coast to visit my parents in AZ. I’m already crossing my fingers for our Jan travel from MN to AZ!